St. Basil of Caesarea, the Great, (AD. 330-79) was one of the three Great Cappadocians, along with his younger brother, Gregory of Nyssa, and their close friend, Gregory of Nazianzus. Together, they contended for and advanced understanding of the doctrine of the Trinity. Everything Basil says in this polemical work, On the Holy Spirit, he says as a pastor and not as a triumphalistic theology warrior who wants to mop the floor with his opponents, the second wave Arians. 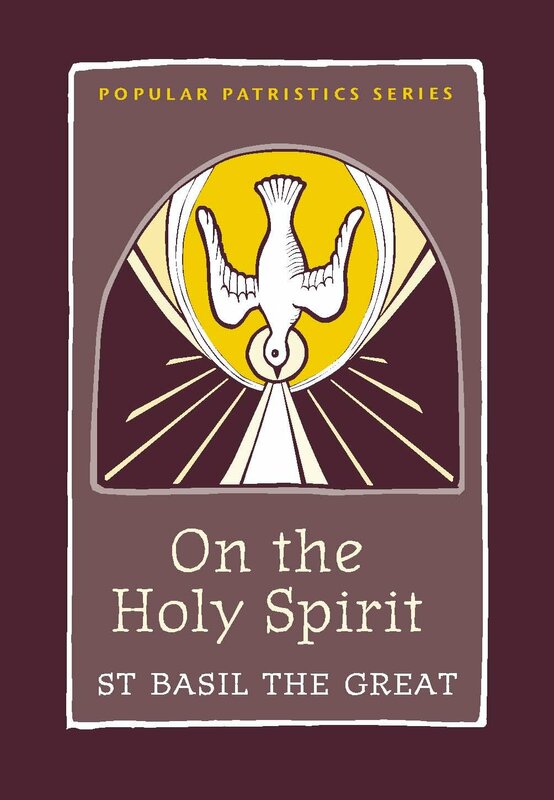 Basil argues not because he wants to but because he recognizes what is at stake: the truth regarding the Holy Spirit as fully God. Basil knows that ultimately the glory of God and the salvation of people is at stake. He sees that a sub-Trinitarian doctrine of the Holy Spirit robs God of his glory and the church of truth. He is concerned with the eternal state of both his own flock and that of the universal church, but also the eternal state of the heretics. Basil is a shepherd who involves himself in this controversy out of love for God, Father, Son and Holy Spirit, and out of pastoral love for people. You may not go as far as Basil in how much authority you attribute to church tradition, but his arguments from tradition may not simply be discounted. A careful reading of this work discerns a higher level of authority attributed to Scripture than to tradition by Basil in the way he argues, even if he makes some statements that seem the two hold equal weight for him. He clearly is aware that tradition may not contradict Scripture. Also, his heretical opponents argue against the deity of the Holy Spirit from a Bible-only viewpoint (so they claim). *It is important to note Basil's use of the term "non-Scriptural," by which he means not unbiblical, but rather something not spelled out verbatim in Scripture, chapter and verse. It may and does include things derived from Scripture through good and necessary consequence. 1,1: “I admire your proposing questions not for the sake of testing, as many now do, but to discover the truth itself. For now a great many people listen to and question us to find fault, but it is most difficult to find a soul that loves learning and seeks the truth as a remedy for ignorance” (27). 1,2: “It is not for the slothful in piety to listen attentively to theological words and to try to search for the meaning hidden in each phrase and in each syllable; rather, this belongs to those who know the goal of our calling: it is offered to us to become like God as much as human nature allows. Likeness to God, however, cannot be had without knowledge, and knowledge comes from teaching. Speech, though, is the beginning of teaching, and the parts of speech are syllables and words. So, the investigation of syllables does not fall outside the goal [of our calling]” (28). There is no word too small or insignificant that, if placed in a crucial location either in a theological formulation or in a passage of Scripture, what one decides regarding its meaning will not make a huge and consequential difference. Orthodoxy may ride on such a word (28). 2,4: Basil opposes heretical attempts to use differences of wording—“from whom,” “through whom,” “in whom”—to say that the three persons of the trinity are three different natures rather than the same nature in three distinct persons (30-31). 4,6: “What, then, does this logic-chopping come to? The nature of the cause is one thing, that of the instrument, another, and that of the place, still another. Therefore, the Son is different in nature from the Father, just as the instrument is from the craftsman, and the Holy Spirit is different insofar as place or time are different in nature from the instruments or those who use them” (33). 5,7: “These, then, are the sorts of arguments they make, but we will show what we proposed, namely, that the Father does not take ‘from whom’ for himself and cast off ‘through whom’ to the Son, and that the Son and the Holy Spirit do not, as their law has it, spurn being joined to ‘from whom’ or ‘through whom.’ Their new apportionment of phrases has established this: ‘There is one God and Father, from whom are all things and one Lord Jesus Christ through whom are all things’ (1 Cor 8.6). These are not the words of someone who is making a law, but rather of someone who distinguishes the persons. For the Apostle speaks thus not to introduce a difference in nature but to establish the unconfused conception of the Father and the Son” (33-34). “‘Who has known the mind of the Lord and who has been his counselor?’ (Is 40.13). The answer is: ‘the Father loves the Son and shows him all things’ (Jn 5.20). It is he who holds together the earth and grasps it in his hand. It is he who orders and regulates all things; he, who keeps the mountains in equilibrium, who sets the limit to the waters, and who supplies proper order to everything in the cosmos. It is he who sustains the whole of heaven with a fraction of his whole power……” (34-35). 5,8 - 5,12: Basil shows that the phrase “from whom” is also applied to the Son and Holy Spirit in Scripture, and the phrase “through whom” is applied to the Father and the Spirit. He also shows that “in” is used of the Father, Son and Spirit. Thus, the heretics contradict themselves, for they must either say (to remain consistent with their previous syntactical argument) that the Father is subservient to someone, or else that the terms above do not, as a rule, indicate different and distinct natures. Their use of language discounts the variety of use in Scripture and thus does not prove different substance/nature between the three persons. Basil also shows that the terms “from” and “through” are used interchangeably in places in Scripture, the exact meaning determined by the context. All of this refutes the heretical argumentation (35-38). 6,13-6,15: The heretics teach a subordination of the Son to the Father and of the Spirit to the Son based on their belief that glory is rendered to the Father through, rather than with, the Son (39). Basil argues that the Son is neither chronologically inferior to the Father (he “was with God in the beginning”), nor positionally inferior or subordinate (as in, “at the right hand of the Father”). The Son and the Father are equal for if one sees the Father, they have seen the Son (39-43). 7,16-8,17: Contra those who say that “through whom” and not “with whom” is appropriate for referring to the Son, Basil says: “But to the lovers of Christ I say that the Church knows two usages and does not refuse either one of them as if it conflicted with the other. When we contemplate the greatness of the Only-begotten’s nature and the excellence of his dignity, we proclaim that the glory belongs to him with the Father, but when we think of his beneficence towards us or our access to and our kinship with God, we confess that this grace is worked for you through him and in him. Consequently, “with whom” befits those who are giving glory, while “through whom,” those who are giving thanks” (43). The tradition of the Fathers shows the use of “with whom” in reference to the Son in the doxology, and the Fathers derived it from Scripture. “For the ‘reflection’ is contemplated with ‘the glory,’ ‘the image’ with the archetype,’ and the Son in every way with the Father. The sequence of names does not admit separation, and much less does the nature of the things” (44; 45-46). 8,18 – 8,19: The power of the Son is for our care, salvation and blessing. In his saving ministrations toward believers, he acts not “out of a slave-like subjection, but rather as a voluntary solicitude that acts according to the will of God the Father out of goodness and tender-heartedness for his own creation” (47). The Son is the Way to the Father (48). From the Father, through the Son, come all the abundant blessings of faith and life. All the Son is and does for us is from the Father (48-50). 8,20: Regarding the submission of the Son to the Father’s will, Basil says: “he uses such expressions not to be lacking in freedom and self-determination and not as through he is waiting for an agreed upon signal to begin. He uses them to make clear that his own will is received in unity and without interruption form the Father. Therefore we should not take the command that was spoken as an imperative that is announced through vocal instruments and that legislates for the Son what he must do under obedience. Rather, we should think of a sharing of will that reaches timelessly from the Father to the Son in a way suitable for God, as, for instance, some figure appears in a mirror” (50). 8,21: Sometimes Jesus says that he does nothing apart from what the Father tells him and that he only speaks and does the Father’s will. At other times Jesus is clearly speaking and commanding what he himself wills and desires. Basil says Jesus uses “one set of expressions to make us know that he is our Lord and Maker, and…another to have us learn the Father of our Lord and Maker” (51-52). “He is inaccessible in nature, but approachable in goodness. He fills all things with power, but only those who are worthy participate in him. He is not participated in all at once but shares his energy in ‘proportion to faith’ (Rom 12.6). He is simple in substance, but manifold in powers. He is present as a whole to each and wholly present everywhere. He is portioned out impassibly and participated in as a whole. He is like a sunbeam whose grace is present to the one who enjoys him as if he were present to such a one alone, and still he illuminates land and sea and is mixed with the air. Just so, indeed, the Spirit is present to each one who is fit to receive him, as if he were present to him alone, and still he sends out grace that is complete and sufficient for all. The things that participate in him enjoy him to the extent that their nature allows, not to the extent that his power allows” (53). 9,23: The Spirit is near to Christians not in proximity but because of holiness. As a soul is cleansed of its sin and made pure, it is restored to its image, able once again to reflect the light of the Spirit and the image of God, and thus participate in the heavenly, spiritual life (54). 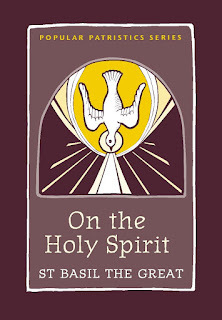 10,24-10,26: Basil argues against those who say the Spirit is not equal with the Father that the regeneration of baptism, the very beginning of faith, is received in Scripture as being in and into the triune name, including the Holy Spirit alongside the Father and Son. Thus, they are equal (55-57). 11,27: Those who deny the deity of the Spirit are transgressing against the vows they take when they are first initiated into the church. Also, if the Spirit is equal with the Son, then denial of the Spirit’s divinity is on the same level of error as denial of the Son’s divinity (57-58). 12,28: Although the Apostles sometimes leave out some of the persons of the trinity when mentioning baptism in passing, all three are implied; the Son and Spirit are mentioned alone sometimes in mentions of baptism, but the church recognizes all three are always intended. “For the invocation of Christ is the confession of the whole, since it is clear that God is the one anointing, the Son is the one anointed, and the Spirit is the anointing…” (58-59). 13,29-30: When Apostles call upon angels to witness something with Father and Son, they are not leaving out the Spirit as lesser than Father and Son, nor elevating angels, for many things are called upon to witness in Scripture –rocks, earth, heaven, etc. (60-61). 14,31-33: Some say that the baptism of the Holy Spirit is a lesser thing, like the OT baptism into Moses, and not equal to/the same as baptism into God. Basil shows that baptism into Moses was a type of the baptism into God which was to some, and is not on par with Christian baptism (62-65). 15,35: “there are two purposes laid down in baptism, first to abolish the body of sin so it no longer bears fruit unto death, and second, to give life in the Spirit and so bear fruit in holiness. The water furnishes the image of death, just as the body is received in burial, but the Spirit infuses life-giving power, renewing our souls from the death of sin to their original life. This, then, is what it means to be begotten again from water and the Spirit: as death is accomplished in the water, our life is worked through the Spirit” (67-68). 15,36: Basil sees baptism in fire as passing through God’s final judgment, not simultaneous with baptism of the Spirit when baptized in water (68-69). 16,37: Basil shows from Scripture that a sin against the Spirit is a sin against God, and that a gift of the Spirit is a gifting given by God (69-70). 16,38: Whatever in creation is said to be holy receives its holiness from the Holy Spirit, for holiness is not inherent in created things but extrinsic and imparted by the Spirit of holiness (70-73). 16,39-40: Not only was Jesus anointed with the Holy Spirit, but all that he accomplished in his earthly ministry and in the founding and equipping of the church was accomplished with and through the Holy Spirit, as will be the consummating, future acts of salvation (73-75). 17,41-43: Basil refutes the convoluted argument that the Spirit is sub-numerated beneath the Father and Son and thus he is lesser (like base metals beneath precious). Basil reasons (among other things, such as this argument being absurd) that by the same logic, these heretics would put the Son beneath the Father, which is error (76-79). 18,44-45: Counting the three persons in order does not imply rank, nor a plurality of natures/substances (79-81). 18,46-47: The Spirit glorifies the Father and Son, but as it is in the Spirit’s light that we see God’s light, the Spirit participates in the glory of the Father and Son. He is not a lesser rendering glory to the greater, but an equal whose glory glorifies persons who are his equals in glory and stature (81-83). 19,48-50: The Spirit is rightly glorified, for he participates in all the works done by the Father and Son in creation and redemption (past, present and future). The Spirit is assigned the same attributes as the Father and Son, and in Scripture a sin against the Spirit is considered a sin against God (84-87). 20,51: The Spirit is not a slave nor freeman but, with the Father and Son, participates in their kingship and is thus master, and so worthy of fear and honor (87-89). 21,52: The Spirit is given the title “Lord” in Scripture, both implicitly and explicitly. Also, Scripture is said to be given by God and by the inspiration of the Holy Spirit, and when Scripture says that God dwells in us it says similarly that the Spirit of God dwells in us, making the terms equivalent (89-91). 22,53: Like the Father and the Son, the Holy Spirit is also witnessed by Scripture to be incomprehensible and unknowable to the world (91-92). 23,54: Like the Father, and unlike angels, the Spirit is said to be omnipresent to work the purposes of God at different locations simultaneously. Thus, he is also worthy of the same honour rendered to God (92-93). 24,55: Some argue that the Spirit ought not to be glorified. Basil points out that there are many things which are not God and yet are worthy of glory. In light of the fact that Scripture elevates the Spirit above all these other things—indeed, to equality with God—it is illogical not to render him glory, even for those who do not understand him to be fully equal in all ways with Father and Son (93-94). 24,56: The Spirit is not to be ranked among creation, which all receives its life from God, for Scripture says that the Spirit is the life-giver, and thus places him as equal/one with the Father and Son, in whom people have life (94-95). 24,57: Some say that the Spirit is the gift of God and the gift is not worthy of the same honour as the giver, yet Scripture also speaks of the Son as God’s gift and yet he is honoured as equal with the Father. Indeed, the Spirit is the very presence of God in us which allows us to call upon God as our own Father, the Spirit’s voice becoming our own (95). 25,58-60: Basil argues that the heretics make too much of semantic arguments that one ought to render glory “in” the Holy Spirit, rather than “and to” the Holy Spirit (along with Father and Son), and decides there is not enough difference in the meaning of the words in their contexts not to also see glory going to the Spirit as well as through the Spirit to the other persons (96-99). 26,61-64: The Spirit is in those who receive him/life pure lives. The grace of the Spirit is in the heart of him who receives him as art is in the person of the artist. It is manifest when an artist does art, and the Spirit is manifest when a Spirit-filled person exercises the gifts the Spirit gives. Also, the believing/holy person is said to exist in the Spirit. Yet no where is it said that the Spirit is in the Father or Son, yet their close/equivalent relationships suggest the Spirit must be with them if so much of what is said of the Father and Son can also be attributed by Scripture to the Spirit. True believers must worship in Spirit and in Truth – if Jesus is “the Truth”, then true worship is both in the Spirit and in the Son, which worship is directed to the Father (99-103). 27,65-68: “In” is used for Father, Son and Spirit. Basil explains where the practice of using “with” for the Spirit came from. Scripture and tradition are equal in authority for the church (says Basil) and many practices that are part of the institutional church were passed down as mysteries from the Apostles. So many church practices are received as legitimate; why not confession in the name of Father, Son and Spirit (as per baptism)? If we demand explicit biblical wording for every tradition, much must be discarded from church practice. “In” and “with” are different but not contrary. In the Spirit better describes our relation to him, where “with” the Spirit better describes the Spirit’s communion with God. Thus, it is legitimate to offer praise both in and with the Spirit (103-08). 28,69-70: Those who recognize that we will rule with Christ and thus receive glory along and in conjunction with the glory he receives are foolish and sinful to disallow the Spirit to receive glory with the Son (108-10). 29,71-75: Argues that keeping the “non-scriptural” traditions is apostolic, for Paul says to maintain the traditions he taught the churches “either by word or by letter.” Basil received traditions passed on by the one who baptized and trained him for ministry, just as his mentor also first received them, going back to the ancient fathers (whom he lists) who used “with” for the Spirit, and rendered the Spirit worship (111-17).